One of my new year resolutions was to try to keep up on the house better. As a Mom, I have so many responsibilities. I sometimes get overwhelmed by the amount of things I have to do. One of the things I tend to hate to do is make beds!! Although I love when it’s done and it makes the room feel so much cleaner, It’s a pain, let’s be honest!! Layers and layers of tucking and straightening! My kids are 5 and 3 and in no way are they going to be able to make their own beds. I came across Beddy’s Bedding and my mind was blown!!!! This is the best invention EVER!!!!! My life has been forever changed. Moms have enough to do and now with these beds even small children can make their own beds and help a mamma out!!! When I saw this bedding I was inspired to do a whole room make over. 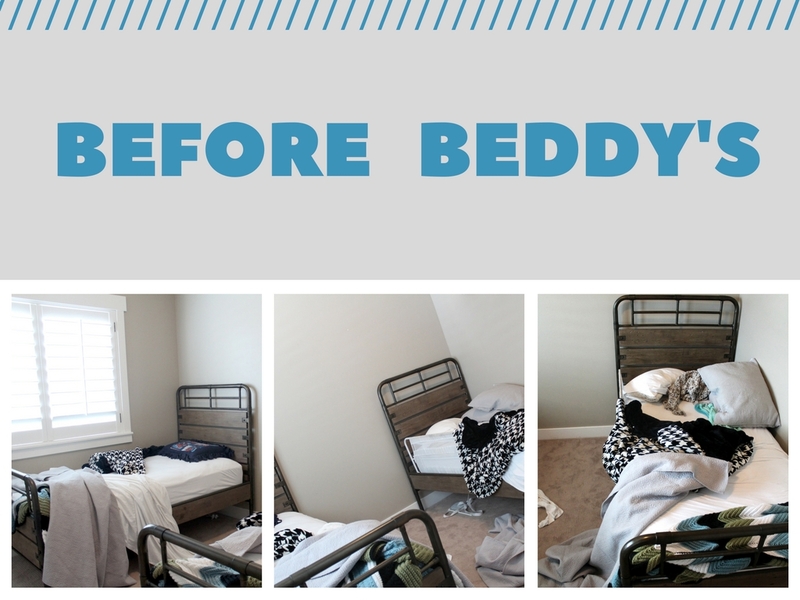 I have included before and after shots along with some close up images of the amazing Beddy’s Bedding. I would wake up to this everyday!!! 3-4 blankets and sheets just thrown all over the room!! Most days I just left it like this! It was more work then it was worth. add a bunch of toys on top of that and the room was always a disaster!! 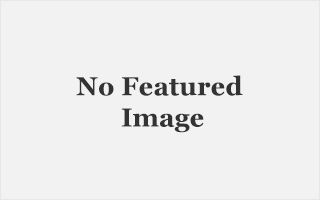 Until …..
Life changer!! How awesome is this? The bedding slips on over the whole mattress like a fitted sheet. It has a heavy-duty zipper on both sides and will unzip all the way around. Under the comforter is a minky blanket, that will extend out past the zipper to make it have the feel of a regular blanket. Included with the bedding is a sham and a pillow case. Beddy’s is machine washable. You just pull the entire thing off, wash, and throw back on. The quality is unbelievable and it is tough enough to withstand my 3 yr old zipping it up and down. 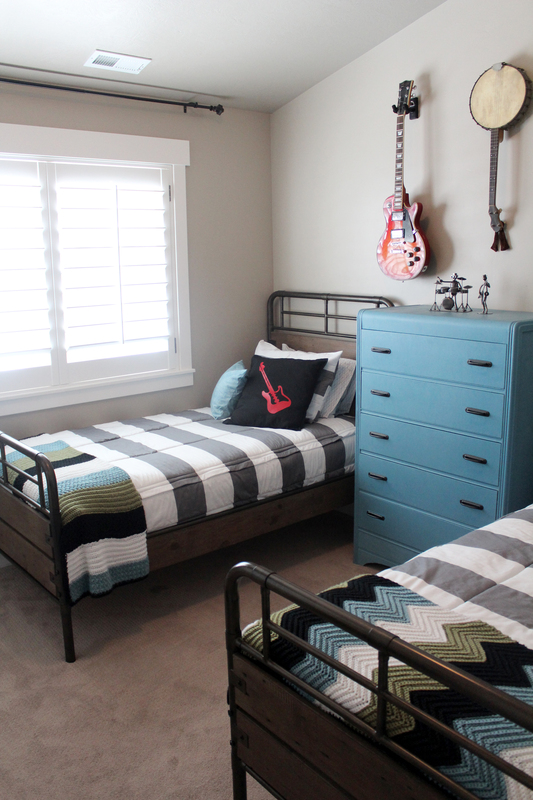 I love how sleek and clean Beddy’s makes the room. The boys can lay and jump all they want and the bed stays looks fabulous. So now that we have the bed situation handled, let’s get onto the decorating!!! I went with a music theme. My boys have a passion for music already. Not a day goes by without singing, and playing instruments, so this was perfect. My brothers are huge musicians and have been collecting beautiful instruments for years so I hit them up for some pieces. 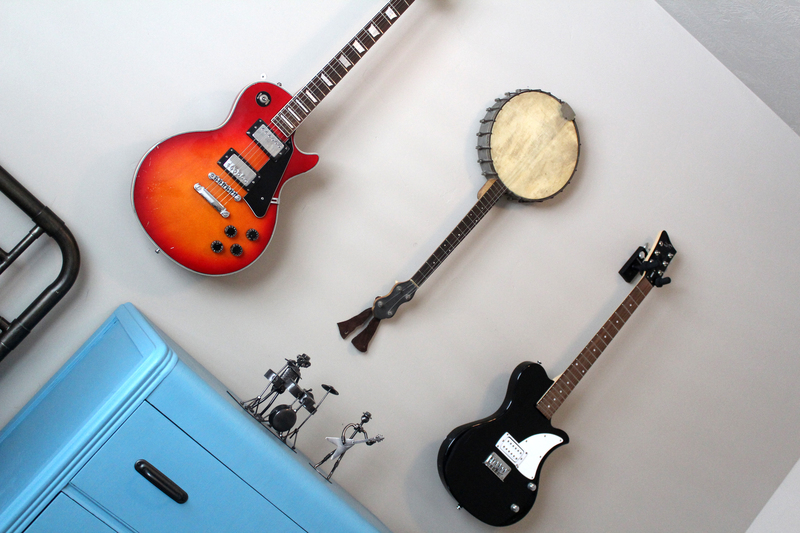 I found the black guitar on KSL for only 20$ it doesn’t have strings but its perfect for a wall hanging. So check out your local yard sale sites and KSL for some 2nd hand items. I began by finding this inspiration piece. I got the color scheme from this picture that I got from Hobby Lobby. I loved the muted colors and variety of instruments that is showed. After I had the color scheme down, I had my mom crochet these darling blankets for the beds. I love how they bring the color down onto the beds. 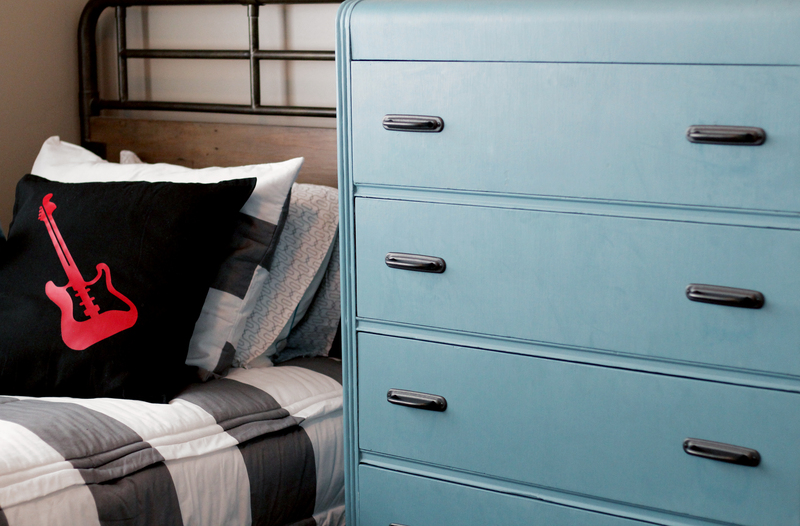 This old dresser was a major project for this room and it added so much. I’m in love!!! I painted it with the Annie Sloan Chalk Paint. I found it at Drab to Fab. I took the blanket in and showed them the color that i needed. They mixed 2 colors together to get the perfect tone that i needed. They were so helpful and made it an easy stop. This paint is amazing to work with. NO SANDING OR PREP NEEDED!!!!! Whaaa??? no for real! Just start painting your project. This was 2 coats and then the wax coat that seals it all up. The finish is so smooth and really gives it a professional look. The handles were purchased from target. I loved the industrial look of them. 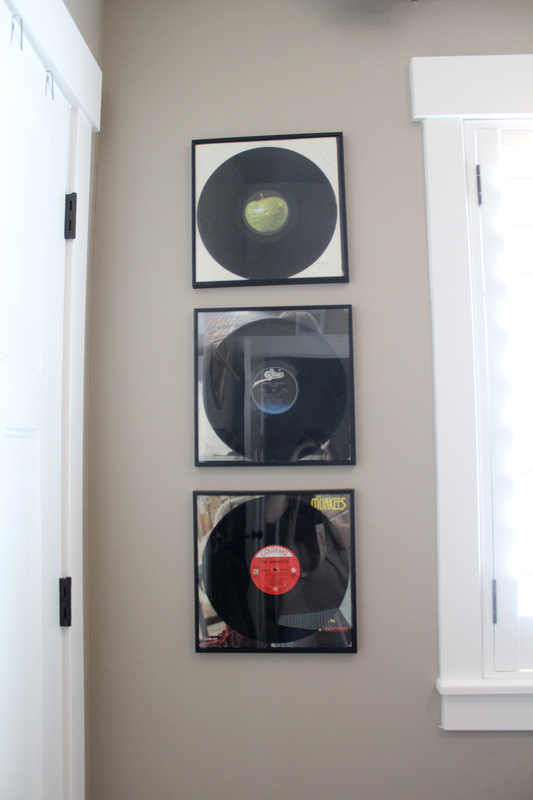 One of my favorite elements of the room are the old records! I happen to find these is my parents basement! Classics like the Beatles, Michael Jackson, and the Monkees. It brings back so many old memories and I love that they have been in my family for years. 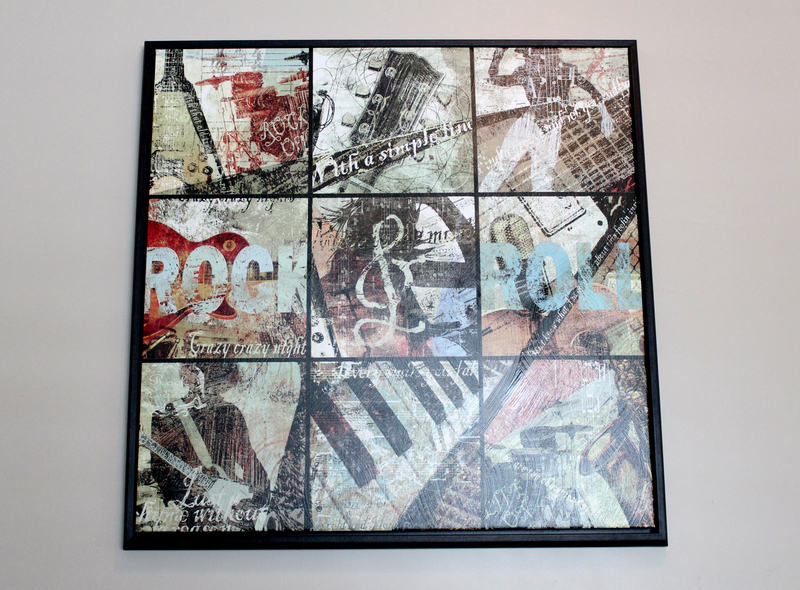 The record frames can be found at IKEA. 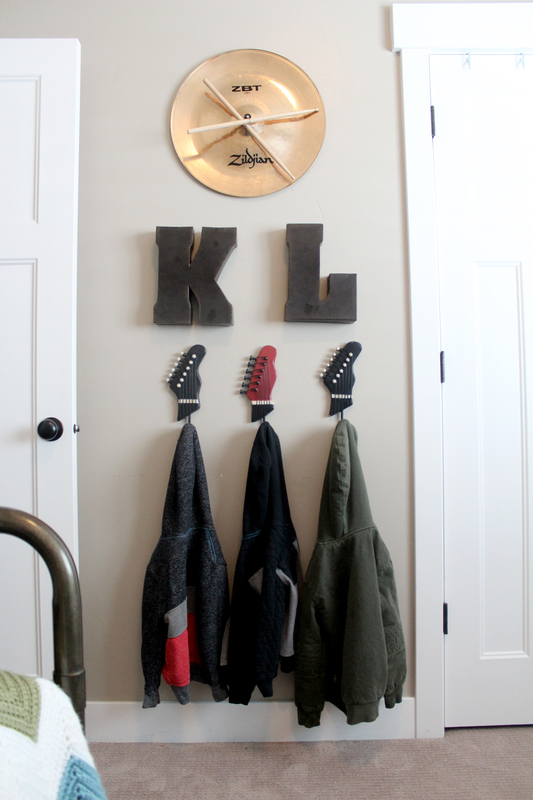 Every room needs some hooks for the kids to organize and hang coats and back packs. I found these darling hooks at Hobby Lobby! Metal Letters also found at Hobby Lobby. For the finishing touches I added a few pillows to the beds. I got some pillow covers from IKEA, only $4.99! I customized them using the Cricut Explore Air 2. 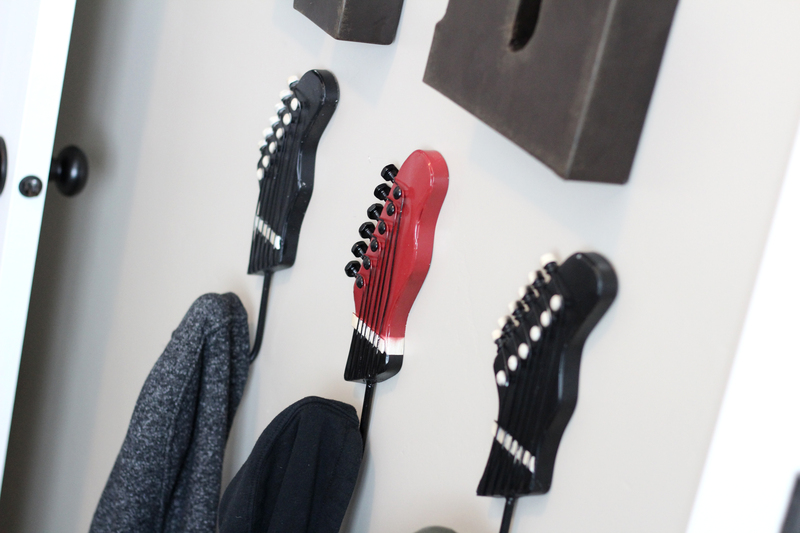 The guitar and headphone images were already available in Design space so it made for a very quick project. 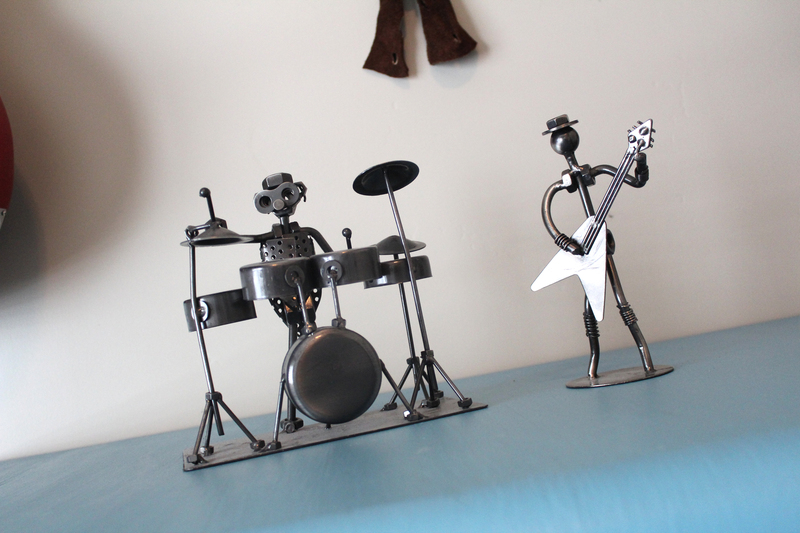 One final little touch was the nut and bolt drummer and guitar player on the dresser. They were just too cute to pass up. 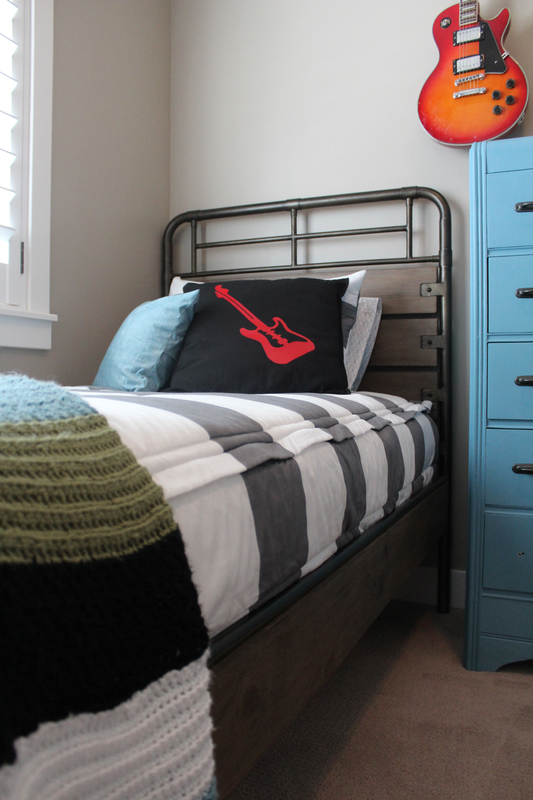 This project was so much fun to put together and I am so excited that the boys room will be more tidy and that they will now be able to be responsible and help make their own beds every morning. Beddy’s Bedding can be found –>HERE and they have a variety of colors and styles to choose from. 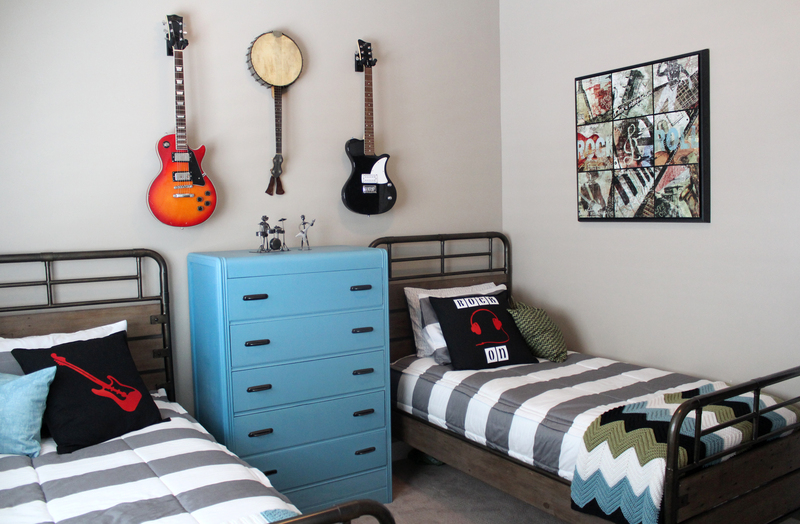 Beddy’s isn’t just for kids either! They have queen and king sizes available. Great for all ages. 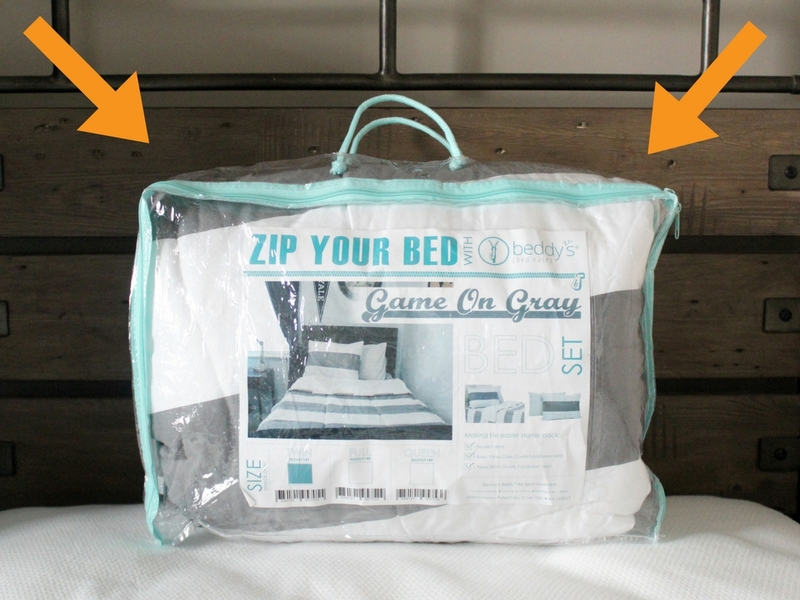 Get your Beddy’s and make your daily routine a little easier! !